Files are as safe as their last backup, so make sure you backup your files regularly, especially with a trusted off-site backup provider. If your file extensions are hidden, you need to manually uncheck ‘Hide extensions for known file types’ in the Control Panel’s Folder Options window. Harmful attachments can only execute malicious actions if you open them, so set your webmail preferences to block attachments with .exe, .scr or .vbs extensions. As a backup measure, and in case you haven’t yet blocked harmful attachments, make sure you check the extension of each email attachment before opening it. Software and apps are continually being updated to maintain their security status and help you protect your devices, so keeping them up to date is vital. Patches can quickly update, fix or improve software security vulnerabilities, so by installing them as soon as they’re available you’ll be improving your software’s performance. Many users use the same password for multiple sites and applications, which makes them a softer target. Use at least 15 mixed characters, and no dictionary words. AutoPlay/AutoRun was designed to make application installation easier for non-technical users, but it also makes it easier for ransomware and other malware to install via USB storage devices, CDs and DVDs, so rather install software and apps manually. When using any public wifi – such as in a café, hotel or airport – unknown users can log onto your computer unless you disable file sharing, so make sure that you do. A firewall is a piece of firmware in your computer system that protects it from unauthorised access. These days most routers come with a firewall built in, but check your computer to make sure your firewall is also enabled. In a nutshell, macros are instructions that automate a set of commands to carry out specific tasks. They should be used to make repetitive tasks easier, but cyber criminals can use them to infect your computer with their own instructions, so don’t turn macros on. RDP enables others to access your desktop remotely, so only enable it if you need to in a particular instance, and remember to disable it once you’ve done what you have to. If you’re an administrator, do what you have to and then log off. Certainly don’t browse the Internet or do any more than you have to while you’re logged in. Ransomware uses the Internet to activate its encryption routine, so by turning off your Internet, you can disrupt the routine and seek advice on next steps. Ransomware can pass undetected through bluetooth and infrared ports, spreading between devices without the need for passwords, so turn them off as soon as you’ve done what you have to. And last, but not least, whatever you do, never pay a ransom. 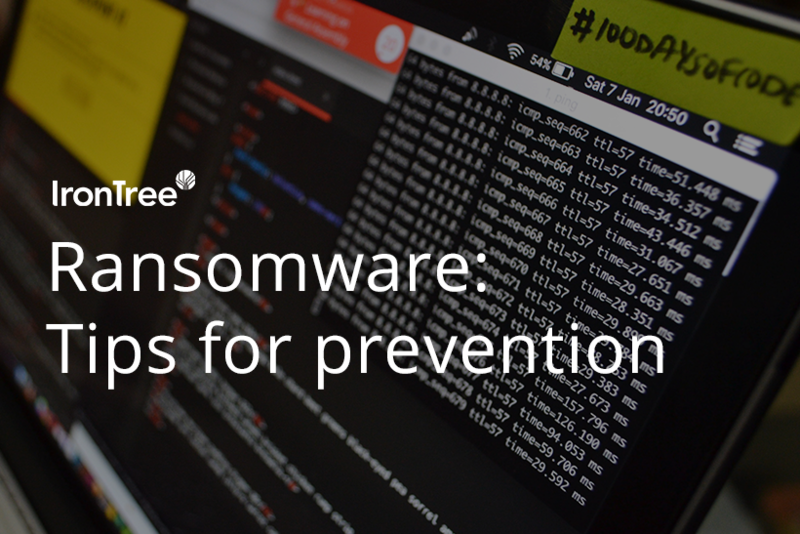 IronTree can help you with its dedicated ransomware protection service. Please click on the banner below for more information.